Welcome to Italy. You will be met by one of our friendly team at the arranged meeting point and transferred to Piedmont. The first two nights' accommodation are based in a typical Italian vineyard offering splendid views over the Alps. On arrival there will be plenty of time to meet other guests and have a bike fitting before we plan an afternoon ride towards Castello ducale di Agliè. This gentle 40km ride is perfect for those wanting to stretch their legs after a long day's travel. This evening dinner will be served in the vineyards very own dining hall. The menu, a typical Piemontese offering will be accompanied by the vineyards very own selection of wines. Those wishing to can join a tour of the vineyard after breakfast, as well as a look behind the scenes at the vineyards very own organic ice cream factory. What could be more Italian! The finish of today’s important stage is Ceresole Reale which can be seen in the distance from the vineyard. We have planned a beautiful ride that will arrive at the summit of this picturesque climb. We will get there in plenty of time to watch the pro riders battle for stage victory. Those wishing to ride back to the vineyard will have an option to do so. This evening, dinner will be enjoyed in a local agrotourism where the food is grown on the farm and ingredients locally produced. Aldo and his family have owned the ristorante for over 50 years, and his outlandish personality will ensure an evening to remember. This morning we say goodbye to Piedmont as we take a transfer over to the stage start of today’s race. St Vincent is certainly worth a visit and amongst the most beautiful towns in Aosta Valley. You will have time to see the riders warming up pre-race and get photos and autographs of you favourite riders. From St Vincent we will transfer you the short distance to the town of Aosta where you will have time to change into cycling gear before riding the last 50kms of today’s stage up to Courmeyer. The final 10kms are a steady climb to this very popular sky resort. On arrival at Cormeyer, we have arranged a place for you to shower and change out of cycling clothing. You will have free time to enjoy the town, watch the race, and find a spot for dinner. The day will finish with a transfer to Lake Como. There are few climbs in the world cycling that evoke emotion like Ghisallo and Muro diSormano. Indeed there are few places in the world as beautiful as Lake Como. After breakfast, we’ll roll out from our hotel in Varese and ride through Como before heading north towards Bellagio. On arrival at Bellagio, we will meet at a stupendous bar run by our friends for a buffet snack before those wishing to ride Ghisallo and Muro di Sormano with our guides. For those who want to enjoy the view, they can simply sit back and enjoy Lake Como. Viewing of today’s stage will be on one of these epic climbs, and clients will have time to descend and watch the final few kms of today’s stage in the bar where we will also be having dinner. This evening we will transfer to Lake Iseo and the home of Italy Bike Tours. Rest day for the Giro but an opportunity for clients to enjoy the delights of one of the most unspoilt areas of Italy. We will again be offering two routes for riders. The first a magical and relatively flat ride around the beautiful Lake Iseo and Franciacorte wine region. The other a more challenging day that includes 100km and Morirolo. Today is a day to spot the riders who will be riding around Lake Iseo. We have a special treat and surprise only for our guests. Wait and see! This morning we will enjoy the stage start in Lovere before transferring you to Ponte di Legno. From here, clients will have time to change in to cycling gear before embarking on one of the most famous climbs in the world Passo Gavia. The Cima Coppi of this year’s tour offers fantastic viewpoints overlooking the Alps. 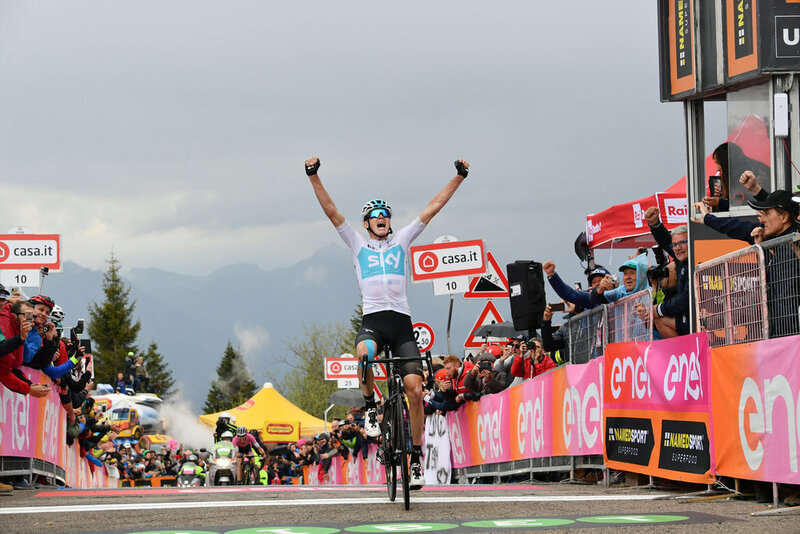 Once the last riders have passed, you will descend back to Ponte di Legno to our meeting point where once again you will have the opportunity to shower and change, and position yourself at the finish line to watch the final meters of the Queen stage of this year’s Giro. This evening we will enjoy a Pizza evening in Val di Sole - handmade by the most Italian Canadian you have ever met! This morning we explore the partenza village and expo and watch the riders warm up before Stage 17 kicks-off. This will incorporate a 40km riding loop that is relatively flat . On arrival back at the hotel, clients will have time to change and have lunch. As always there will be an option for stronger riders to enjoy a more challenging ride of 120km to a next hotel in Moena! Moena itself is a fabulous town and well worth exploring. This evening clients are free to enjoy discovering Moena for themselves why this is one of the most beautiful towns in the Dolomites. We do things differently. As Giro stages go, today is amongst the most boring in recent memory! 220km of mainly downhill riding will result in the inevitable sprint that Viviani will win (maybe). So we have decided to give our clients an extra treat and ride the most spectacular 55km’s in the world. This evening dinner will be enjoyed in the hotel restaurant. We will be climbing the opposite side to the Giro, which means we will have the mountain to ourselves. On arrival at the summit you will have a chance to enjoy VIP hospitality at the finish line. The perfect place to enjoy a glass of wine and nibbles whilst watching the fight for pink. All good things must come to an end and this morning it is time for emotional goodbyes and one last great coffee and brioche. Staff will be on hand to transport you to Verona Airport or a pre-arranged destination.